The Camera- its constituent parts of lens and body, is the driver in the project. 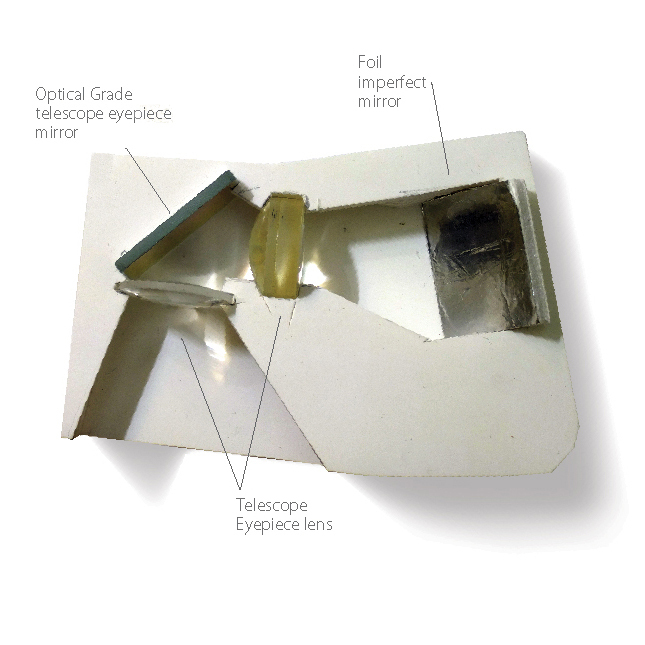 The Lens- taking the optical concepts of refraction and reflection of light as a metaphorical driver for the passage into a raised pair of theatres. 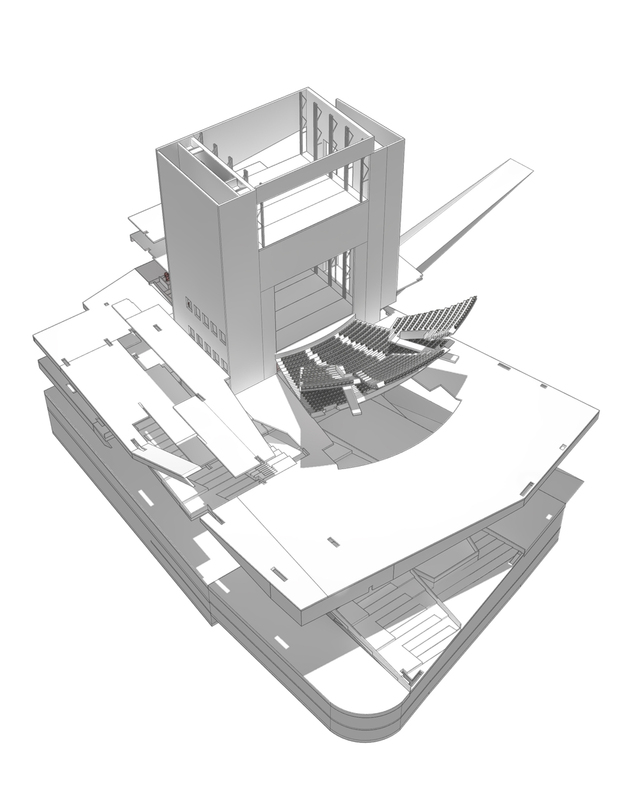 The project uses several colours and programmatically linked spaces that move in plan and section to wrap the theatre in transient active space. These refracted “tunnels of light” serve to both veil the theatre as well as enhance the visitors experience of the performance by distancing them from the street and regularized life. The Body- the mechanical and service portion of the project that allows the theatre to function. The project has a single “ultra-fly” that travels through the totality of the project within which each theatres individual fly is contained, as well as a stage with horizontal segmentation. This ultra-fly allows the rest of the production and other back of house operations to be above street level, freeing the ground to the city. The investigation began where the previous semester; design thinking, left off; using architecture as lens to transport the occupant unto a new plane as they go to the theatre. Light is the occupant, the lens the architecture. A mock up lensing abstraction of this can be seen above, depending on initial trajectory the light gets focused at a different node. This concept had limitations however; creating a very defined itinerary was stifling. While working with this, a new apparatus was created, using the sites’ shape and ideas about the trajectories inside. A mylar screen was placed atop; and the resulting complexity and overlapped rays of light became the source of the geometry of the project. Three miles west of the Gateway Arch and Mississippi River, the historic theatre district of Grand Center sits atop one of the subtle hills of St. Louis, bordered on three sides, the site’s tapered shape became a driver for the project. The Blue Theatre, the larger proscenium theatre, seats 1348. It is encased in several differentiated enclosure layers. The large backstage space is open physically to the viewers within the hall. Large vertical baffles, made of variable opacity glass; as well as variable height suspended acoustic shells, can acoustically enlarge the hall as well as visually obscure the space. An outer glass shell encases the hall and baffles. 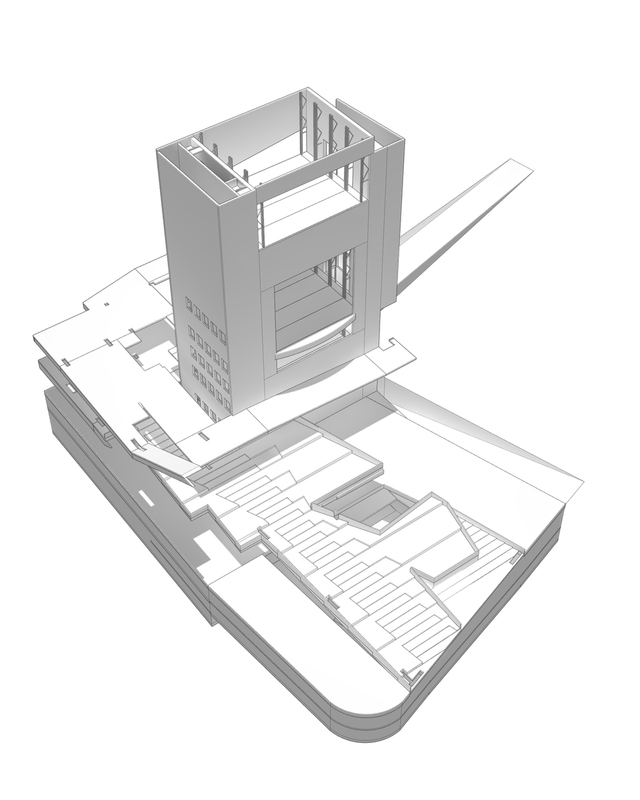 Two circulation towers extend over and into the “piano noble” that serves as the main social space of the project. Forming a sort of urban lens, the variable transparency and acoustical nature of the space provides the space in which new forms of theatre can be performed. The Red theatre, a smaller end stage theatre, is in the lower section of the building. Glass with variable opacity forms the sides and back wall of stage of this theatre for different functions. Seating 513, it does not have an extensive backstage. The Green Corridor; wrapping from ground level to the very top of the building, functions as a prefunction space for the entire building. 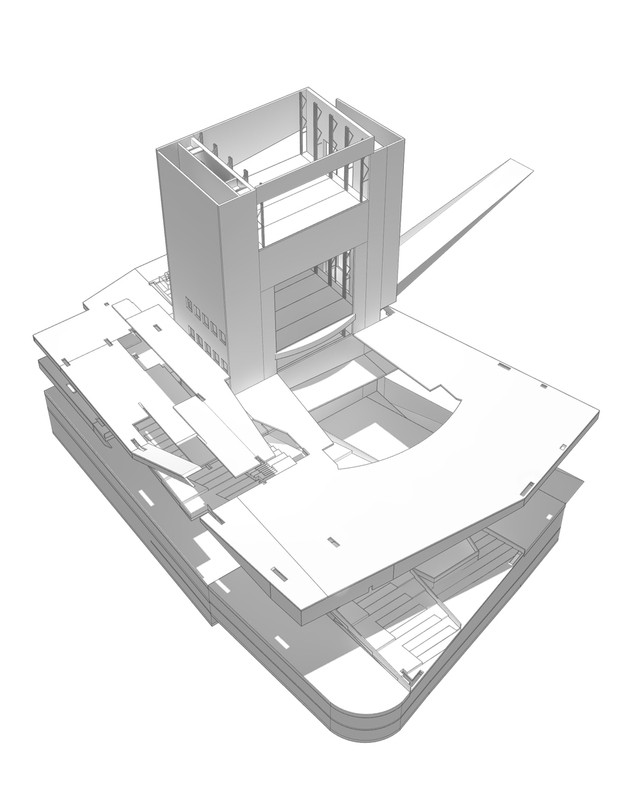 Containing a small cafe during daytime use and a rooftop bar for evenings, it provides unique views at the highest elevations in the project. The final 1/32 scale model is constructed of layered plexiglass carved and etched with the interior details of the building. 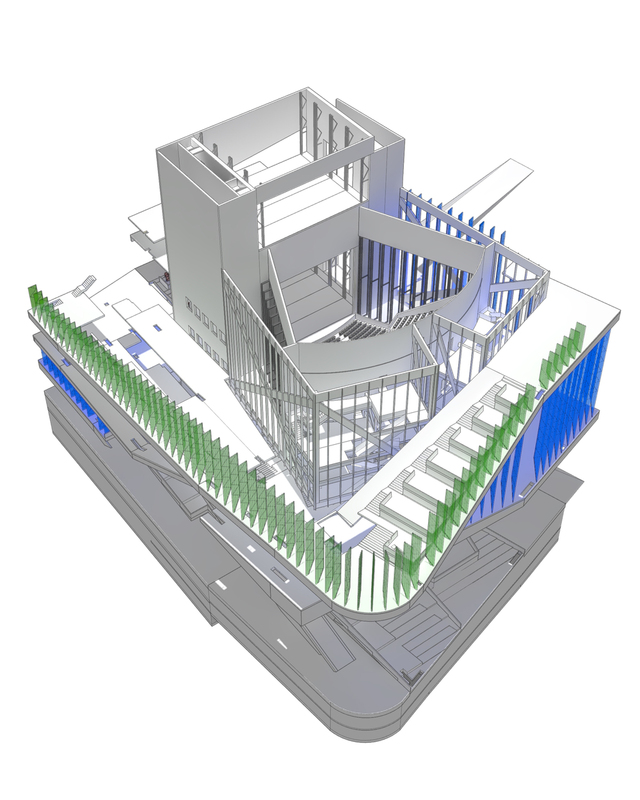 Color is added to the interior walls abstracting the vertical corrugated polycarbonate fins in the blue and green portions of the building. The context is basswood with rough sanded acetate; all of which is illuminated from below.